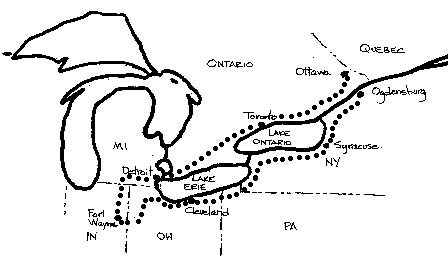 A Quick Report of a trip through East Central parts of "The two Best Countries In the World"
Over the winter of 1999 in New York after arriving from California, I spent many happy days visiting family, friends and some of old co-workers across the border in Ottawa (Canada). Well, last July it was time to take a road trip. I needed to go to Michigan, and so a general plan was laid to get there via a few visiting detours along the way, much like my circling in the southwest a year ago. It was perfect weather with long sunny summer days and gentle winds to send waves across the wheat fields. 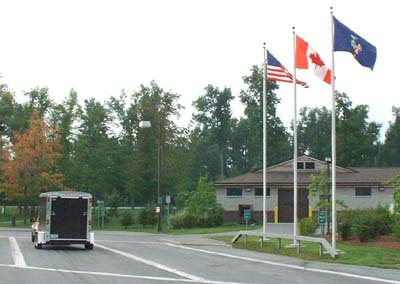 Setting out down along the St. Lawrence river and picking up Interstate 81 to go south to Syracuse thence to Rochester, it was easy to lose track of mileage. And so it was that I arrived in Cleveland, at the Rock & Roll Hall of Fame. 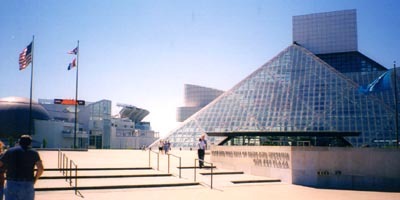 If ever you get to Cleveland, you must visit…..and you know, the things that were most interesting to me were the impromptu notes and ideas scribbled on bits of paper and dinner napkins by the likes of John and Paul, Fats, and Dizzy, not to mention the photos. Now some people in the east or west might laugh if someone said there are vineyards and good wine coming out of Ohio. But it’s true. I saw them and tasted the fruits of the labors myself. No guff. 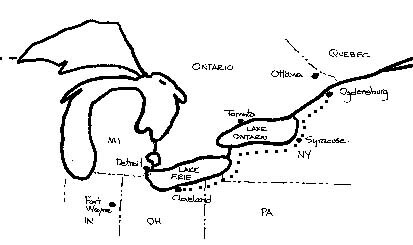 Around Sandusky Ohio, on the south shore of Lake Erie, there is an industry doing just that. In fact, those of you who have travelled to Napa/Sonoma might see the resemblance between the Korbel winery and the midwest building version below! 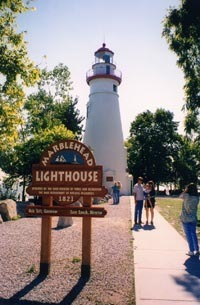 And nice big lighthouses also mark the shoreline of the Great Lakes, like this one at Marblehead. 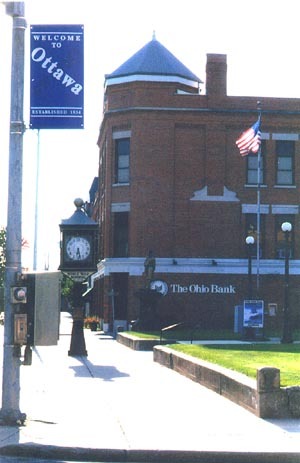 Milan Ohio is a small town with a very distinguished favorite son. 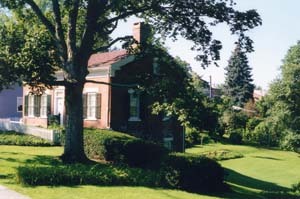 It was here that Thomas Edison was born in 1847. How could I, of all people, not make a pilgrimage to such a place? "Thomas A. Edison was born here"
Well, if you’ve lived or worked in Fremont CA, it’s OK if it’s escaped your notice, because this water tower is actually in Fremont Ohio, where I stayed overnight! 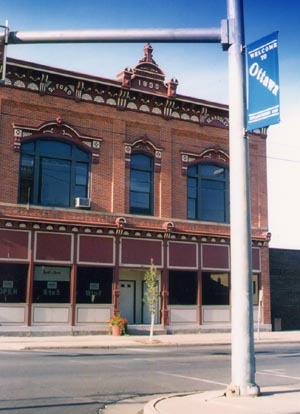 So there’s a sister city twinned in the midwest. When you’re travelling across vast areas of rolling farmland rich with golden wheat, you don’t really expect to come across caves. After all, this is more likely in the hilly and mountainous areas. So it was with great interest that I took a side trip out of Fremont to the Seneca Caverns. You arrive in the middle of the day, with not a cloud in the sky, and "yellow face" drenching everything in bright sunbeams with high temperatures (95F). The sign announces the cavern entrance but it looks like a typical house sheltering under large trees. 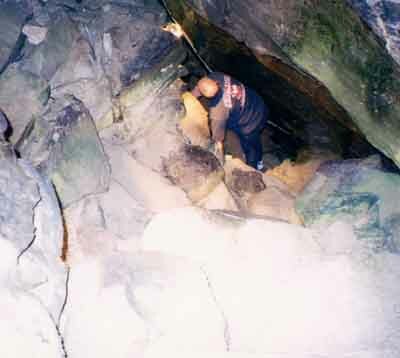 This area of the country has extensive geological history, and limestone quarrying is nearby. 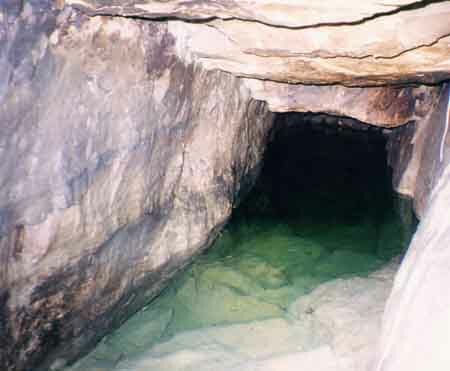 Many years ago, a small opening was discovered when a dog when into it, and upon exploration, was found to be quite extensive underground.. 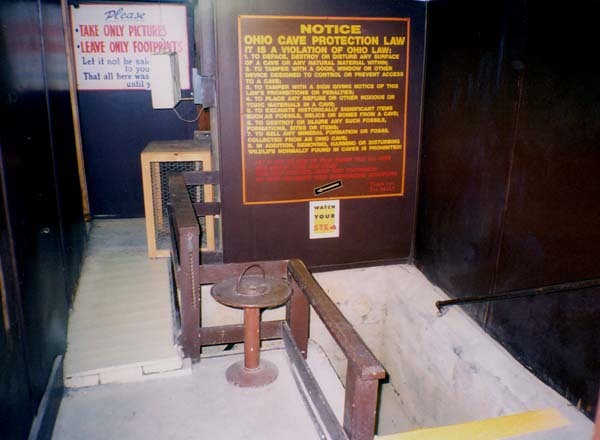 Yet it’s not for people who dislike small passages., starting off with a trip down the stairs into the basement, and then downstairs from the basement into the depths. Finally back ON Terra Firma, I couldn’t resist a trip to Ottawa. 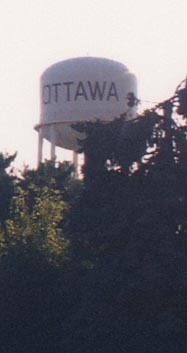 Anybody in Ottawa or Zomax Arnprior recognize this water tower? Probably not, since this is in Ohio too. A pleasant town, with friendly people. 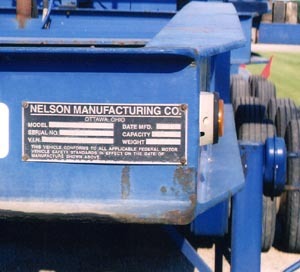 And a local business specializing in HEAVY duty trailers (notice my Jeep in the picture). This 60-wheeler gives the term "Oversize Load" a whole new meaning. Speed bumps get trimmed easily too. 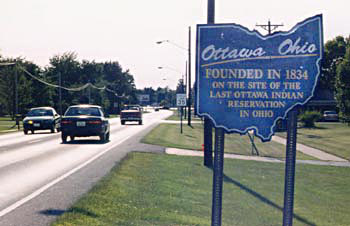 The Ottawa Indians were very active travellers! And thence into Indiana. And north past Fort Wayne, to my hotel for the night, outside Fremont. 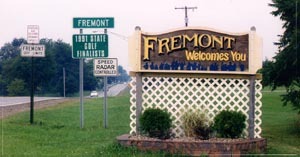 But this time, it was Fremont Indiana! Now for you westerners with a penchant for maps, it turns out that Fremont is only 60 miles or so from Plymouth……does this make you happy…..or nervous…! 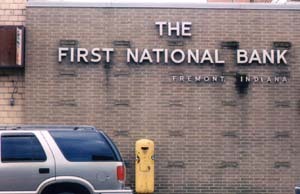 Thank goodness we’re talking about the Fremont in IN and Plymouth IN, which (unfortunately) I had no time to visit. 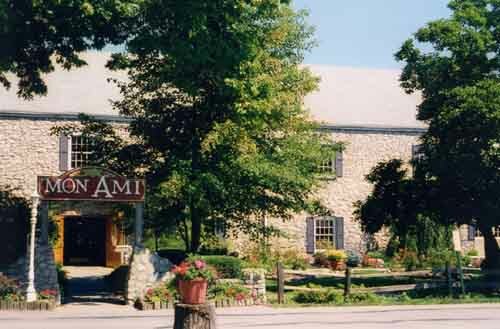 I’m sure relations are good between Fremont CA offices and Plymouth MN offices, but I can tell you that back in KAO days, the old offices in Plymouth MA were more than 60 "philosophical" miles from the Fremont CA offices! 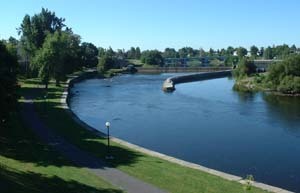 And thence to Ogdensburg, where the Oswegatchie river joins up with the St. Lawrence. 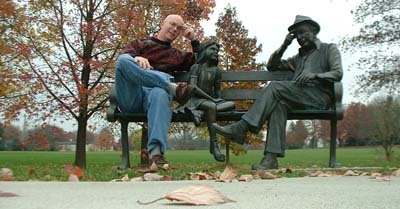 But on the way to the plant, I took in the fresh air, visited the breakfast spot, and then enjoyed a chat with two bronze figures taking a break on a local park bench! 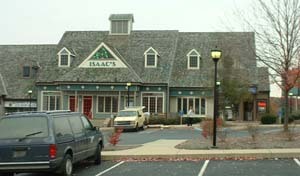 Many years ago, this was American Helix, which became an important part of KIC, and later reverted closer to its roots with David back at the helm without the assistance of a distant headquarters. 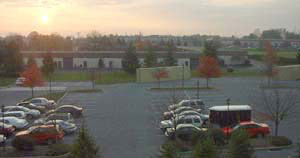 It was wonderful in the early morning to drive through Greenfield Industrial park again, and spend some time with Mr. Dering. Dave and Gord take a moment, while Reeves continues his eternal watch. 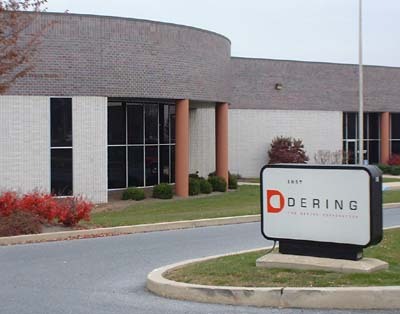 I’m truly happy to report that things are vibrant and active at the Dering Company, and it was nice to have a visit after a three year hiatus. I wish you well in your continuing success Commander Dering! Now it was time to (again) head for home. 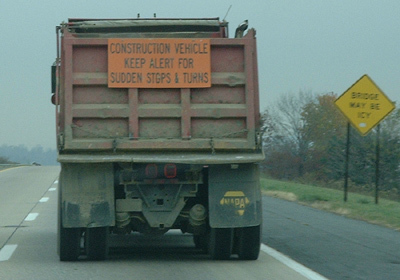 On the way, this interesting truck sign popped up. Who ever said that spelling is not important! So, finally back, it was time to start renovating my new place in Kanata (just a couple of miles outside Canada’s capital city of Ottawa). 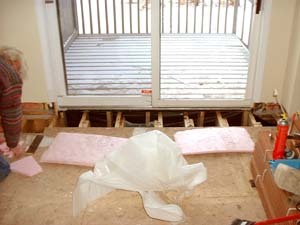 First , the floor joists had to be repaired under the patio door. Over the years, a poor seal in the door sill had allowed water to rot some of the wood. 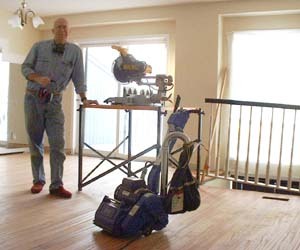 But no real problem-just a few days of carpentry surgery and repair while lying on the floor. 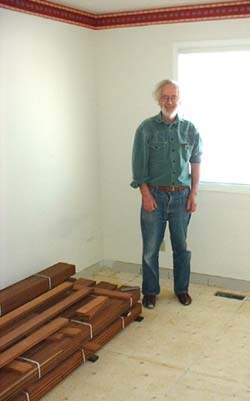 And of course, a very special assistant (my Dad) is on hand to advise, help and inspect! Then two layers of additional 1/2" plywood subfloor are glued and screwed down, and then the flooring went in. Then sand and finish the surface. 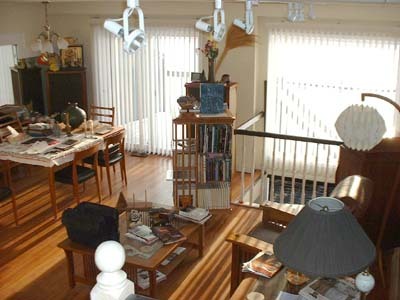 And finally, the place was ready to actually live in, after New Year’s celebrations and a big moving effort. 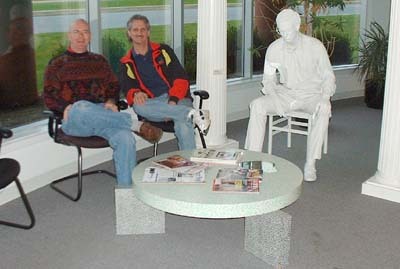 So now as I write this, in March 2001, the sun is streaming in, and a cup of tea is waiting for me in a comfy chair. So I’ll close and go enjoy a break from typing….